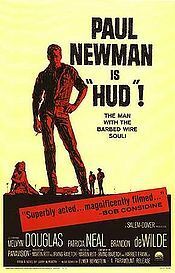 Hud is a 1963 film which tells the story of a self-centered, modern-day cowboy. It stars Paul Newman, Melvyn Douglas, Patricia Neal, Brandon De Wilde and Whit Bissell. It centers on the recurring theme of an unyielding patriarch whose sense of principle and honor brings him into conflict with his only surviving son, a dishonest, self-centered libertine. Lonnie, Homer's grandson, is caught in the middle of this conflict and must choose between the two. The movie was primarily filmed in Claude, Texas.